I love lists. I love making lists and I especially love checking things off of my lists. Chores. To-dos. Dream vacations. New Year’s Resolutions. Really cute outfits I’ll fit into one day. I even made lists as a kid – boys I had crushes on (if you’re out there Colby, I’ve gotten over you), amazing jobs I wanted to grow up and do…just about anything you can imagine, I put it into a list. 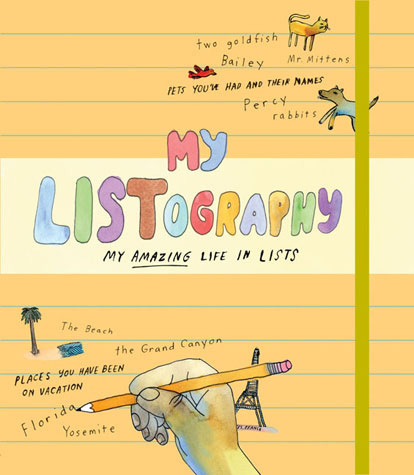 So imagine my sheer delight to find Lisa Nola’s My Listography: My Amazing Life in Lists. It’s a list book for children – like a journal with categories of things like “favorite things about your family” and “if your parents left you alone for a day”…Each page offers a fantastic springboard for creativity and imagination for your children and (don’t tell them this but…) will offer some great practice in writing, too. It’s so important for kids to have a place to write their thoughts and dreams and worries and goals and Nola’s book offers a fun and engaging way for kids to do just that. And just think how awesome it will be for your kids to stumble upon this book of lists when they’re our age! My old lists are a step back in time and yet I really haven’t changed all that much. I can still be an archeologist, right?